Newport Airport was busy this week while 42 students’s attended the Aviation Career Education (ACE) Camp. This is the first time for Newport to host the camp for students in the 6-12 grades. The weeklong camp exposed students to a wide variety of aviation careers, aircraft maintenance technician, meteorologist, pilot, air traffic controller, drone operator, airport planning, and more. Flight simulators were set up at the airport and at the Newport Middle and High School. 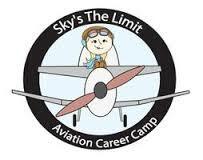 Aden who is entering the 8th grade said his favorite part of the camp was flying a plane. Another ACE attendee Brett said the camp has been extremely fun and enjoyed a riding in a helicopter Both Brett and Aden are first year attendees. Due to damage sustained from a collision, VTrans and the Vermont Rail System are coordinating the emergency replacement of the railroad bridge on Maple Street. Replacement will begin midday Friday August 7 and continue around the clock until Monday August 10. During daytime hours, traffic may be stopped for a maximum of 10 minutes at a time. During nighttime hours, it will be for a maximum of 15 minutes at a time. Motorists may wish to seek an alternate route this weekend due to the construction.